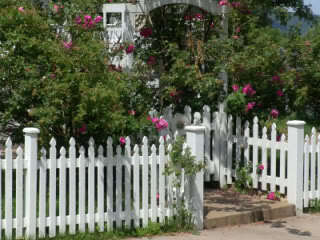 Picket fences are popular both for their looks as well as their association with the classic American dream. In use since the colonial era, they are still popular today and can create a quaint, pastoral look around any home. A picket fence is a great way to mark your home’s boundaries or keep pets or small children from running off. A picket fence consists of two cross beams which run between fence posts, and multiple upright pickets attached to the cross beams. The height and style of the pickets can vary, as well as many other elements which contribute to the fence’s overall look. White is the most common color selected for picket fences, though you can have them painted any color to suit your home’s exterior or to complement the bushes or flowers in your yard. In addition, when planning your fence, you may want to speak with a landscaper and discuss different layout options to match your landscape’s features. While picket fences are usually made of wood – most commonly cedar – vinyl picket fences are also available. Cedar provides a natural look, and has a great feel and aroma to it. However, cedar needs to be properly sealed on a routine basis or it will rot and warp over time. If you opt for vinyl, you’ll get a similar look to wood and you won’t need to repaint or seal it, though it will cost a bit more. When picking out a picket fence, there are many options to choose from. Though shorter than most fences, picket fences can still range from three to five feet tall. Additionally, you have the option of choosing either pickets at a uniform height or varied heights. These can be arranged in a sloping or curved style, and can add an element of design to your home’s yard. Furthermore, the pickets themselves are available in different styles. There are pointier, Gothic-style pickets, or rounder, dog-eared pickets. In addition, you can opt for many different picket widths. While the standard width is three-four inches wide, thinner, more intricate pickets are available as well. Lastly, make sure to invest some time in selecting fence posts, as these play a large role in the overall look of the fence. You can have standard, plain posts, or posts with elaborate styles or post caps. These small details can transform an ordinary fence into an attractive design feature which complements your home. If you’ve decided a picket fence is right for your home, you’ll probably want to hire a professional fence contractor to install it. Because installing a fence involves a lot of effort and know-how – such as digging holes, installing concrete and spacing posts correctly – if you attempt to install one without experience and expertise, your fence will probably not last as long as it should or look the way you imagined. Make sure to clarify what your zoning regulations are for fences. While picket fences do not typically come close to the height limits permitted, you will need to see where it can be installed in relation to your neighbors’ property. Additionally, many cities require permits for constructing a fence, and according to fence contractors in Los Angeles, California, some neighborhoods forbid fences in front yards altogether.